Teeth in a day! 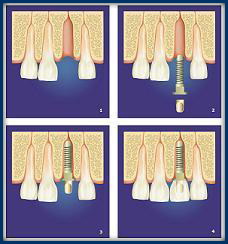 Implants are the most natural, attractive and comfortable solution to one or more lost teeth. With them, you can eat, talk, smile, laugh and even sing as easily as with your real teeth. A superior alternative to conventional bridges and dentures. Procedure: Dental Implant Retain, Complete Upper Fixed Bridge. Patient: Jeannete M. | Delray Beach, FL. Testimonial: I was referred to Dr. Elan Salee. He gave me the best option I had heard. He replaced my loose, painful, upper teeth with dental implants and a permanent bridge. Since then, I have been able to eat whatever I want. What superb work! Where a tooth is missing, a small titanium screw is inserted into the jaw. Over several months, it naturally bonds with the jaw, integrating with the existing bone. Dr. Salee then fabricates a porcelain crown for placement over the implant posts. Once healed and crowned, the new implant helps support your adjacent teeth and bite. It also restores the attractive look and function of your smile. If you’ve ever talked with people who’ve had dental implants in Boynton Beach FL, you’ll know implants are the most perfect solution to one or more missing teeth. People just can’t stop raving about them. Implants look and function just like real teeth. Whether your missing tooth is the result of gum disease, tooth decay or an injury, an implant is by far the most attractive, comfortable and secure solution. Unlike a bridge, no healthy teeth are damaged. Significantly stronger than bridges or dentures, it offers a single permanent solution to a lost tooth. Because, unlike a bridge, it can last a lifetime. Dental implants in Boynton Beach FL are the next best thing to your own natural teeth. An implant naturally integrates with your existing jawbone. By inducing bone growth, the implant maintains the health of your jaw and surrounding bone. It prevents gums from shrinking as they do when teeth are missing. Instead, you maintain your beautiful smile and your attractive profile. This procedure is relatively simple and is effective in almost all cases. So, why put off restoring that great smile? In many cases, Dr. Salee can extract a tooth and provide you with an implant and crown at the SAME appointment. This is an excellent solution if you’re replacing one or more teeth that show when you smile or if you don’t want to wear a removable prosthetic. In certain cases, it may take a series of visits to allow healing and produce optimum results. For more information on dental implants in Boynton Beach FL contact us today!